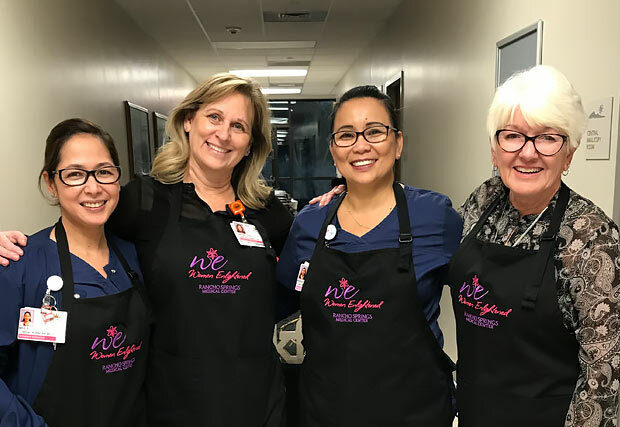 More than 2,000 women from all over the region have joined the Women Enlightened for Better Health (WE) program at Rancho Springs Medical Center. Read about their experiences with the program. "The first time I attended a Women Enlightened event, the topic was the types of cancers that are common to women. That spoke to me as I’m a uterine cancer survivor. Every topic and speaker has been wonderful, informative, and helped me think about better ways to monitor my own good health. At 73, I have learned that almost every negative health issue can be improved by exercise, eating right, getting a good night’s sleep, regular medical check-ups, having good relationships, and attitude. Being a comedian, laughter is high on my list, and I was honored to be invited to bring some humor on the night the topic was depression, stress, and anxiety. A little laughter goes a long way!! "Women Enlightened could be one of Murrieta's best kept secrets. At each meeting, we discuss women's health with other members and healthcare professionals. I have benefited from attending these meetings by learning new information in an informal, relaxed calm setting. Women can listen, ask questions and be guided by professionals who present everyday information to us. Talk about having our world broadened. This is where it takes place. Free literature, advice, discussions and occasional hands-on activities make for an enlightening afternoon. Treat yourself to an inspiring learning event and you just might get lucky with a great door prize as well. Be a lifelong learner and take an active approach with your health issues. I am proud to be a member." "I have been a member of the Women Enlightened (WE) program at Rancho Springs Medical Center for near a year. I really look forward to attending the monthly events, which usually include a free lunch or dinner. The food is delicious too! These events are both informative and fun. There are women of all ages who visit and share their concerns and questions about the various health topics that are discussed. It is wonderful to have this resource available to all women so that we can better manage our health issues and concerns. There is a guest speaker most months, who is often a doctor, who provides pertinent information about specific topics, such as cardiovascular health, breast cancer, hormone problems and more. I highly recommend joining the group and attending the meetings, and maybe even becoming friends with the staff and women of Rancho Spring's Women Enlightened program."